Britax B-Nimble Review: A Lightweight Stroller that Does it All! If you ask me my favorite brand of baby products, I'll be hard-pressed to give you a solid answer. There are so many brands that serve so many purposes, I think it's impossible to narrow it down. Ask me my favorite brand of car seats, however, and I'll tell you solidly that I love, love, LOVE Britax car seats! I've been a fan of Britax car seats since Haiden moved to his convertible Britax Roundabout car seat, but I've never used a Britax stroller. When I heard that the new Britax B-Nimble stroller was going to be released, I enthusiastically agreed to review one! Price: The Britax B-Nimble has a suggested retail price of $199.99, but it's usually at least 20% off on Amazon, making it about $160. Of course, there are cheaper strollers out there, keep reading to see why I think this one is worth the extra bucks. Size: This is a pimped-out umbrella stroller. It's not your everday, $20, breaks-six-months-after-you-buy-it lightweight stroller from WalMart. This is a lightweight beauty that actually comes with a carrying strap for added portability! At 14 pounds, I can sling the B-Nimble over one shoulder, put Piper on my opposite hip and carry both of them through a snowy parking lot into a shopping mall. I love that the simple carrying strap feature allows me to keep my little one out of our rediculously cold Minnesota weather for a few extra precious minutes! This little, 14-pound stroller comes with an infant car seat adapter. It easily fits a Britax Chaperone car seat, and it's also compatible with Chicco, Graco and Peg Perego infant seats. If you've looked at strollers, you know that there aren't many lightweight options that are strong enough to safely support an infant seat. The B-Nimble reclines until baby can lay down until she's almost flat. She can also sit up straight and be anywhere in between! Neither Haiden nor Piper like to sleep when we're out and about with things going on around them, but they both don't mind laying down and resting periodically when they should be napping. This stroller has a great sun canopy! This Minnesota mom has no need to be concerned about UV exposure right nwo since we're not going outside in below-zero weather, but I'm looking forward to strolling outside and keeping the little ones protected with a UV-blocking sun shade! 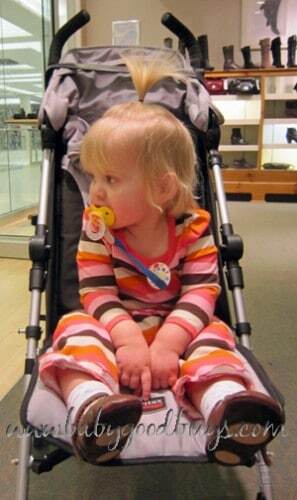 The Britax B-Nimble is VERY easy to fold! While I prefer a one-handed fold feature, this one takes minimal effort to collapse. Even better, there's a “simple fold with automatic chassis lock” feature that automatically locks the stroller in the collapsed position. It does make it much easier to manage when you're juggling a baby, diaper bag and extremely cold temperatures! Basket storage & Cupholder: It's tough to find any stroller with ample under-seat storage, and finding an umbrella stroller with storage space is even harder! the B-Nimble holds my diaper bag under the seat and I can loop my purse around the individual handles to save even more space underneath. The B-Nimble also comes with a cupholder. I don't think a cupholder should ever be optional on a stroller; this mama needs her Diet Coke! Unfortunately, there are too many brands that either make you pay extra for a cupholder or don't even have an option to put one one there. I love that Britax understands our needs in this department! Style: If you're looking for a simple, basic stroller style that does its job without calling attention to you, this is the stroller for you! It comes in four basic colors, with the flashiest being the cute Cowmooflage cow print. Even then, the print is only on the inside seat! 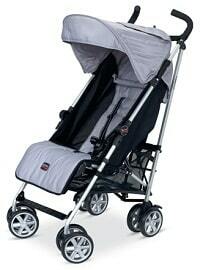 I truly love the sleek simplicity of the Britax B-Nimble. Sturdiness: At 14 pounds, you'd think that this little stroller would feel flimsy. Really, it feels incredibly solid. From the moment I took it out of the box I could tell it was well-made. The pieces are connected without any rattling or instability. Further, it comes almost 100% assembled. There are a few pieces that you have to pop together, but I love that the manufacturer does most of the heavy lifting in the assembly area. It makes me feel safe to know that I was only responsible for putting on the sun shade, wheels and cupholder! All in all, I have to say that I highly recommend the Britax B-Nimble. While both my kids are toddlers now, I wish I would have had this option when they were still in infant car seats! I am so happy that we now have an option for a lightweight and sturdy stroller with tons of features to fit almost any need! Buy it: You can buy the Britax B-Nimble on Amazon for around $160! I didn’t know that there were umbrella strollers that could hold a baby carrier. I’ll definitely be looking at this one! Oooh this looks awesome. Honestly I think the price point is affordable for most families and you know with Britax that your getting a solid, quality item. Love that it only weights 14lbs. Def. going to check this out! That is a very nice stroller. And I have to say, umbrella stroller have come a long long way in the 35 years since I used one.